Serval offers a wide range of feeding techniques to optimise and qualify your production. 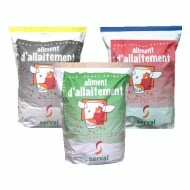 With or without milk powder, we can provide you with a selection of feed that are rich in dairy products. The precise determination of your production targets (choice of race, target carcass weight, conformation, breeding period, feed cost, etc.) will allow us to find the most appropriate diet. Complete milk replacers with or without S.M.P. The Servamix range is made with rigorously flaked cereals, proto-oleaginous products and high-quality straw, providing feeding efficiency and meeting the challenges of veal calf production.